At the conclusion of a solid amateur career, PJ Larsen shared AMA Horizon Award honors with Darryn Durham and entered the professional ranks in 2009 with Team Motosport Kawasaki. He was a top-ten threat in his first season, but that wasn’t enough to secure a solid U.S. ride for 2010. Instead of going the privateer route, Larsen hooked up with upstart Australian team JDR Motorsports and spent a year racing down under. He claimed Australian Lites Championships indoors and out, and when the JDR Squad announced they were going to start an American team, Larsen had his ticket back home. 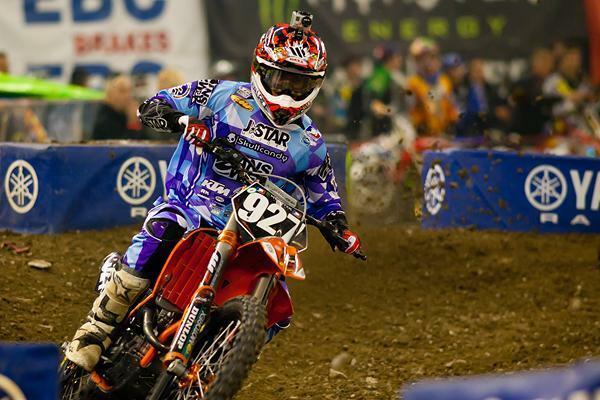 He looked like one of the fastest Lites riders in Houston, but injuries have hampered his results. Now the South Carolina native is beginning to find his stride. 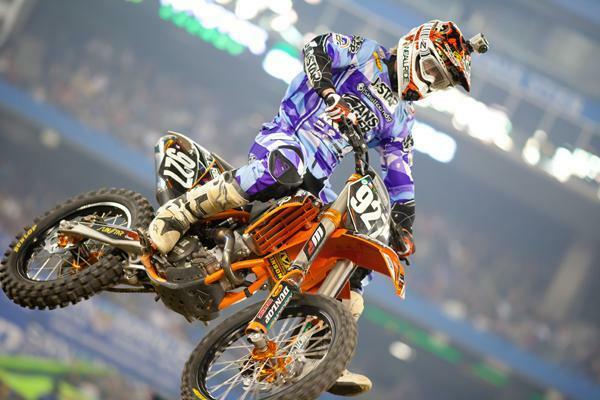 Racer X Online: Okay Peege, was that your best finish ever over the weekend? PJ Larsen: Yeah Weege, fourth place in Toronto, that was best finish ever in the U.S. I’ve got three top fives this year, which is okay, but it’s not where we expected to be. In Houston I was riding pretty good all day and felt confident, but I came together with Stewart. Then the next week I had a pretty good crash, and I hurt my wrist and my knee. I’m still dealing with that today. Larsen has been slowed by injuries, but secured a career best fourth at Toronto. Well then you just pretty much answered my questions here, because you definitely looked fast in Houston, but I was wondering why the results didn’t come. You looked as fast as anyone there. Do you feel that way? Yeah I felt really good. I didn’t know exactly where I was at, speed wise, but I’ve been riding with Ken Roczen at the track and Andrew Short and my teammate Tye Simmonds, so I had a rough idea. I felt good on the bike. But then I had that crash in Houston, then another crash. It’s tough when you’re in a series, you’re trying to heal, but you’re still racing so you can’t take much time off. It’s definitely hard to do, but it’s my job. So the results are getting better now. Is that all because the injuries are starting to heal up, or did it also take a few weeks to reaaclimate to racing here again? I don’t really feel like that was a big factor, I felt fine coming in. It’s just the injuries. Your mind kind of strays away from the right things. Instead of going to the track to do sprints, you’re going to the track to see if you can even ride at all. Then you realize you’re still too hurt and you can’t, so then you’re going home and visiting the doctor again! It definitely takes a toll. Explain how your team deal worked out. I remember seeing you last year at the San Diego Supercross, and you told me how you could have maybe scraped together some sort of privateer deal in the U.S., but instead you took a ride in Australia, because at least you would have some support there. Yeah Jay and Derek Rhinenberg from JDR Motorsports contacted me through friends of friends about coming down there. I thought at first, “Man I really don’t want to do that.” But once I started talking to them more, and they sent me some photos of their shop and team, I started to change my mind. Then they invited me over for the finale in Brisbane and I got to meet everyone. I think it was such a cool opportunity to leave my country at 19 years old to experience living in Australia. It was the best move for my life and career, and it definitely helped that they wanted to have a team in the U.S. for 2011. That was icing on the cake. After a successful tenure down under, Larsen has returned to the states for 2011. So you knew you’d be back in the U.S. all along? It was in the works at that point in time, but it was so far away from where they were then to where we are now, I think it’s something that not many people could do. They went out and hired Nathan Ramsey and Vince Berini, and people like that really make this team work, where I think a lot of first-year teams struggle because they don’t have the right people. We have factory KTM support, and great sponsors in J-Star Motors, WAR Clothing, Answer and Skull Candy. It’s come along in a short amount of time. So you didn’t know for sure that this team was coming over here, you just went for it. Yeah I did. I kind of just put my head down and went for it, but the more I talked to Jay and Derek Rhinenberg, the more trust I had in them. I tell people all the time, they’re the only people in this industry that I would accept a handshake deal with. They’re not going to just fold at mid-season like we’ve seen happen to other teams. Realistically, I knew it would be hard to get a team together here, but I believed they could get it done. So this is actually only your second season in the US, since you were a rookie in ’09. Were you excited to come back and use everything you had learned? Oh yeah I was really excited! I learned a lot my first year, and then I learned stuff in Australia that probably would have taken a long time to figure out. A lot of the things down there helped me get better and faster very quickly, so I couldn’t wait to get back here and show everyone this is where I belong. It hasn’t quite worked out yet with the injuries, but we’re getting better. 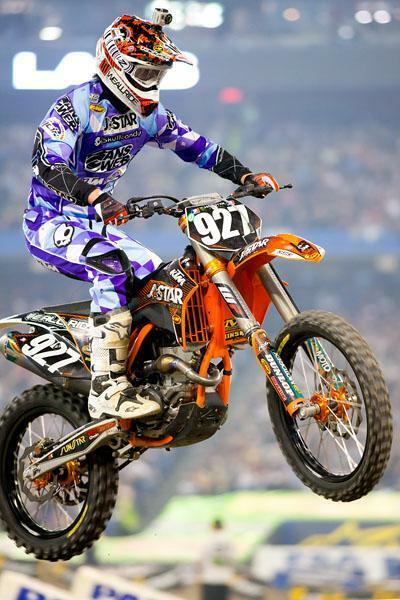 Yeah compare the mindset at your first supercross in 2009, when you were a rookie, and the opener this year. My mindset was pretty much totally different. In ’09, I had a one-year deal and that put a lot of pressure on me to perform. Coming into Houston this year, I already had such a good relationship with the team, and we already knew what we were capable of. We had some goals of where we wanted to be, internally, but our attitude was pretty open, so I didn’t have any added pressure. We just had fun, and I was excited to be back racing in the U.S. It was a lot different than two years ago. Can Larsen land of the podium before the season is over? Now injuries are coming around? Yeah the injuries are definitely coming around. We’ve done a lot of experimenting, me and my trainer Steve Johnson and my chiropracter Dr. Navarro. We had some things happen—things you wouldn’t expect. For example, I got sick from anti-inflamatories. That’s something people do every day, just take an ibuprofen, but then I ended up getting sick from it during the race. So we had to learn about how to get a handle on these things, and that’s where the progression is coming from. The injuries aren’t getting better as much as we’re learning how to control them. Then we can get to that break and heal up. Can you get on the podium? I don’t think that’s unrealistic. It’s like Matt Lemoine told me years ago—that first one is the hardest. So it’s going to be tough for me to break through and get that first podium as a professional. All of the things will have to come together, you know, get the start, get clean laps at the beginning, getting to see the pace those guys are running. Last thing. If you had just gone full privateer last year, where do you think you would be right now? Even though you left the US scene, how much further along is your career now? Going full privateer was a possibility—I had started to look at it. And I think if I had gone that route, I would still be where I was in ’09, which was struggling just to get top tens. And when you’re back there, you’re not getting noticed enough to get picked up by one of the top teams, and then I would probably already be looking at my exit from the sport. And that’s not a good thing! So the whole JDr Motorsports team, they have been so supportive and got me where I am today. I’m so thankful for their support.